San Diego’s Cibus Global is uniting with Canada’s flax growers to develop a crop strain resistant to glyphosate, the active ingredient in the widely used weed killer Roundup. Flax, also known as linseed, is a major crop grown for both its seeds and fibers, with various parts of the plant used to make linen and other fabrics, dyes and inks, medicines, and other products. The Flax Council of Canada is investing about $5.5 million in the partnership, including the proceeds of a $4 million grant it received from the Canadian government. Revenues from the new strain of seed would be split between the Flax Council and Cibus, according to Barry Hall, president of the growers’ group. The deal moves little Cibus closer to competition with Monsanto, the agri-industry giant which markets both Roundup and lines of crops that are genetically engineered to resist the herbicide. Weed killers containing glyphosate are available as generics. Monsanto’s Roundup-resistant strains account for much of the corn, cotton, and soybeans grown in the U.S. 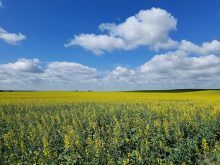 But genetically modified crops have received only limited acceptance (and sometimes harsh criticism) in Europe, which imports 70 percent of Canada’s flax crop. Much of the flax is used to produce linseed oil, which is used in paints, linoleum flooring, and inks. It’s funny though. RTDS is still technically “genetic modification” and the target plant is still technically an organism.. Therefore, RTDS-enhanced plants are still technically GMOs.. I think the most important point here is that Cibus is indeed able to get around Monsanto’s patents. Monsanto is evil, just ask farmer Percy Schmeiser of Canada.